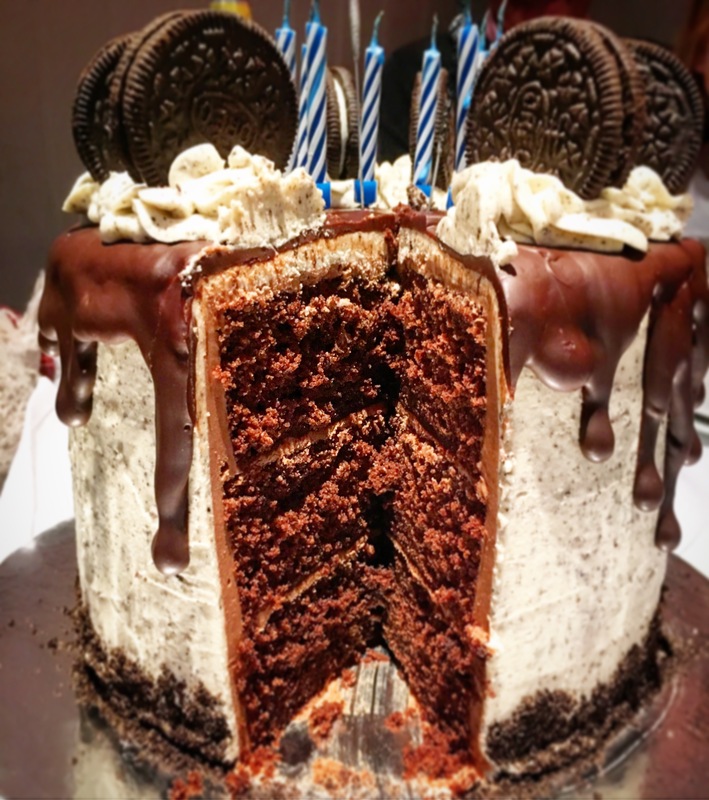 If you like Oreos or know someone who does then this is the cake for you. 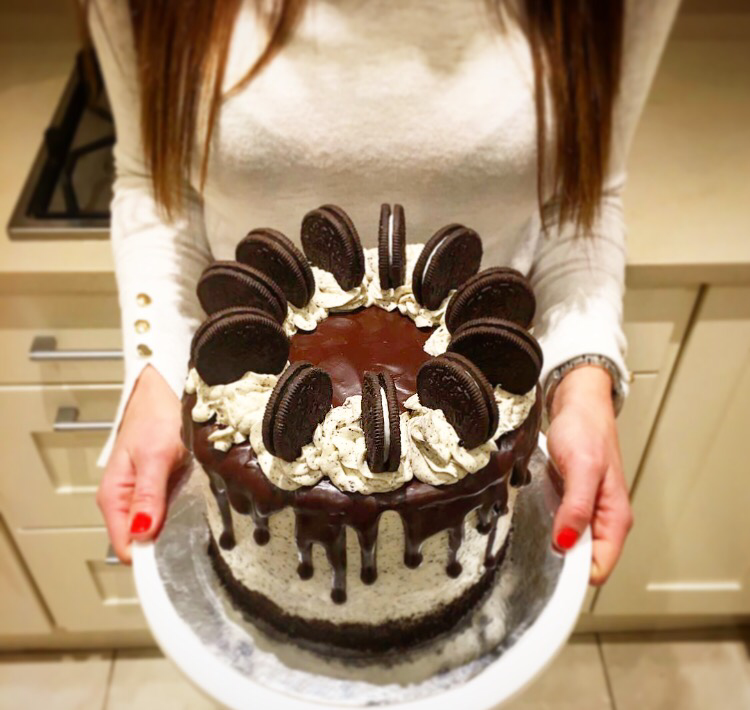 Rich chocolate sponge surrounded by Oreo buttercream, topped with chocolate ganache, more buttercream and whole Oreo cookies – what’s not to like?? It makes a show stopping centerpiece for any Birthday party table! It may look a little overwhelming at first glance but it really is quite simple if you break it down. Get the cakes out the way first, these take a maximum of 35 minutes to make and 25 to cook, then once they’re cool you can wrap them in cling film and leave them for up to 24 hours at room temperature or freeze them for up to a month. If freezing allow to defrost at room temperature for a few hours before you need them. 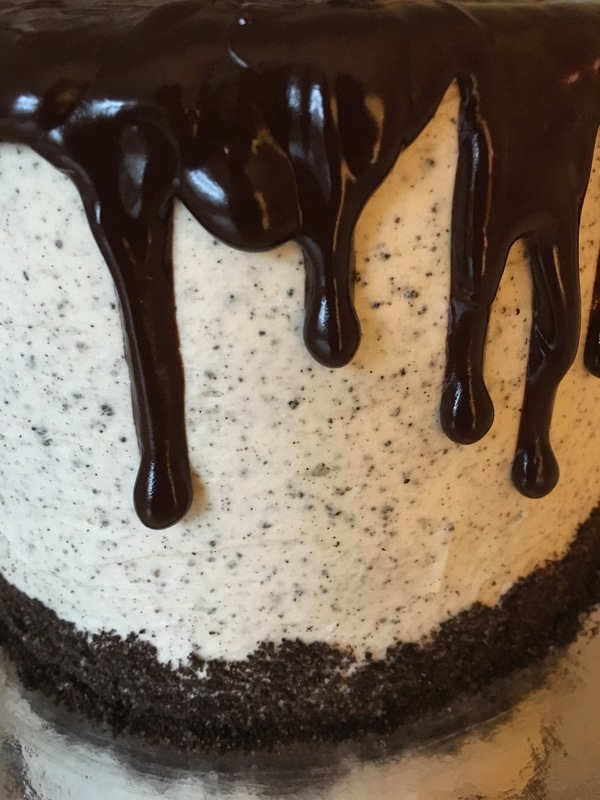 When you’re feeling good and ready you can tackle the buttercream next. This will take you about 30 minutes in total. Get your first ice done then clear up and take a breather with a cup of tea while it chills. After the second ice you can leave it a few hours or even a day before decorating. Like most tasks in life this cake is a lot more manageable if you break it down into easier chunks, stay relaxed and try to have fun too. 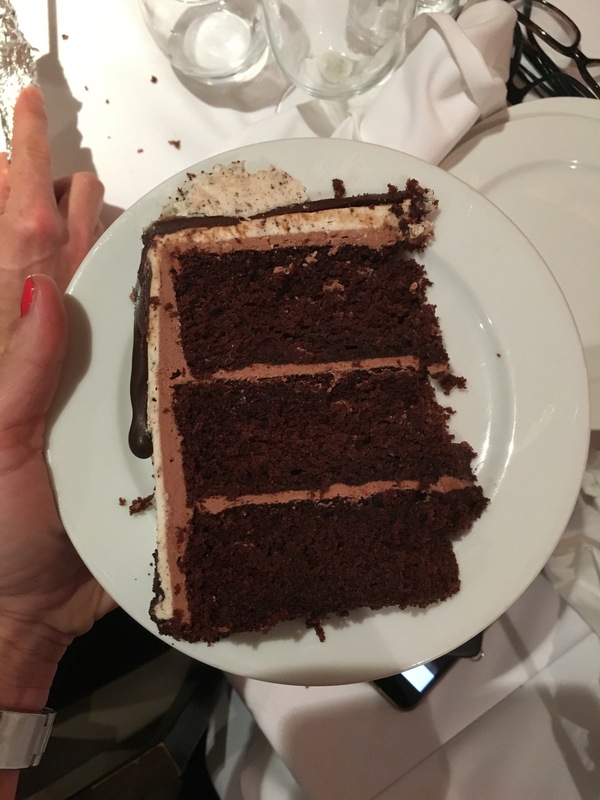 If your icing isn’t smooth or the chocolate looks a little thick who cares? It will still taste great and whoever you have made it for will be so chuffed that they will not be looking for the imperfections. Happy baking! 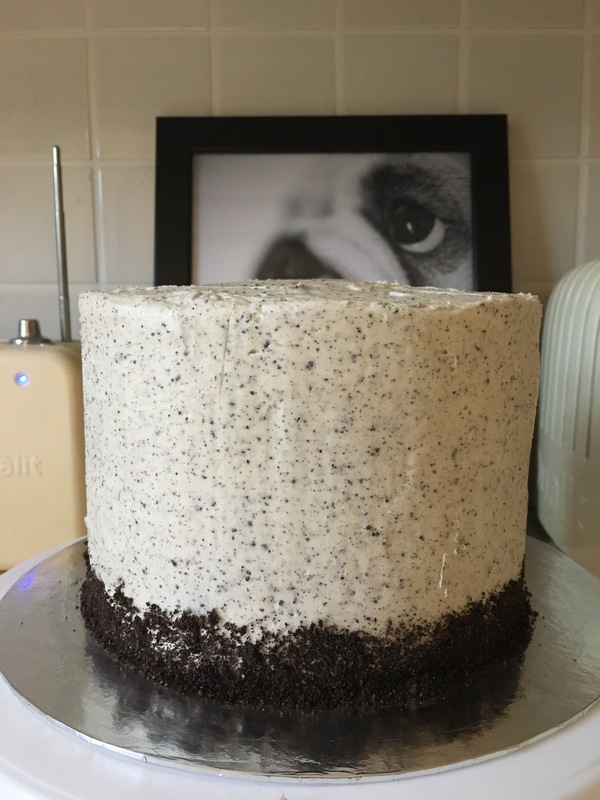 FOR THE OREO BUTTERCREAM *NB I USED HALF CHOCOLATE BUTTECREAM AND DID THE FIRST ICE IN THIS AS I HAD A BATCH LEFT OVER, IT’S EASIER IF MAKING FROM SCRATCH TO USE ALL OREO BUTTERCREAM. Heat the oven to gas 4, 180°C, fan 160°C. Line the bases with parchment and grease the sides of 3 x 18cm (7in) loose-bottomed cake tins. In a stand mixer, or using a hand-held mixer, beat together the butter or stork and sugar until pale and fluffy. Add the eggs one at a time, then the milk mix, coffee and lastly mix in the flour, cocoa and baking powder. Mix briefly until evenly combined. Divide the batter between the prepared cakes tins (if you want to be precise weigh it, it was about 420g per tin) and bake for 28-32 minutes, or until risen and springy to the touch. Leave to cool in the tin for 5 minutes, before turning out onto a wire rack to cool completely. 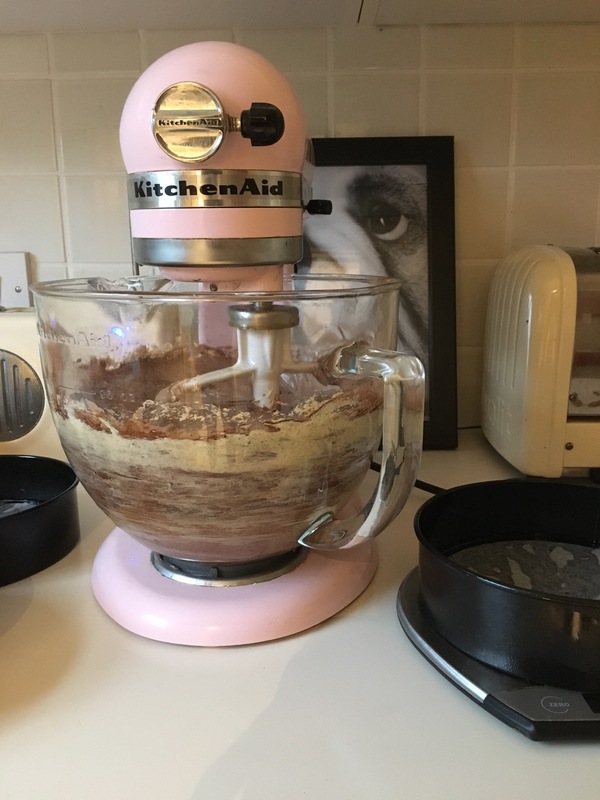 Make the buttercream; mash the butter and the icing sugar together in a large bowl, this will stop your kitchen being sprayed with a cloud of icing sugar. Once mashed beat with electric mixers until pale and fluffy. 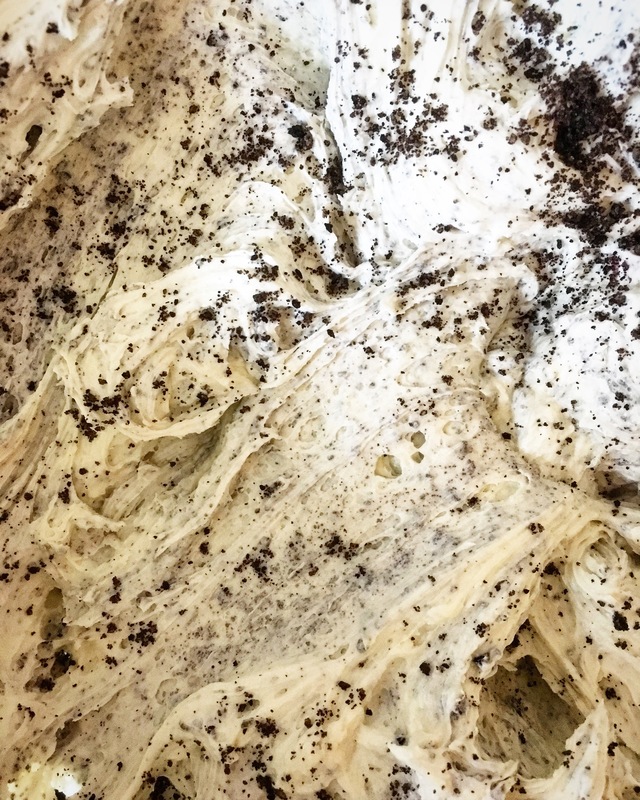 Add the milk and vanilla and beat for about 45 seconds more, fold in ¾’s of the Oreo crumbs with a metal spoon. To assemble: Stick one of the sponges on a cake stand with a little of the icing. Pipe or spread a spoon of buttercream on the cake using a pallet knife. Repeat with another layer, choosing the neatest one for the top, placing it flat side up. Next use a palette knife to roughly cover the entire cake with a thin layer of buttercream. Don’t worry too much at this stage this is called a crumb coat and ensures that your final layer is crumb-free. Chill the cake for at least 30 minutes to firm up the icing. Transfer the remaining buttercream to a piping bag fitted with a star nozzle. 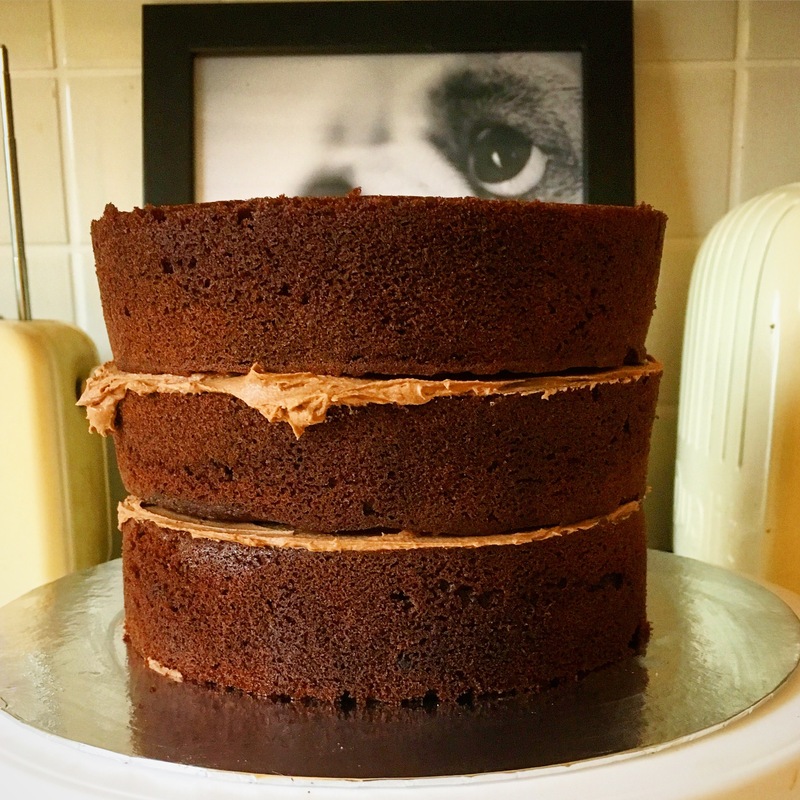 Once the icing is chilled, use the remaining icing to completely cover the cake. 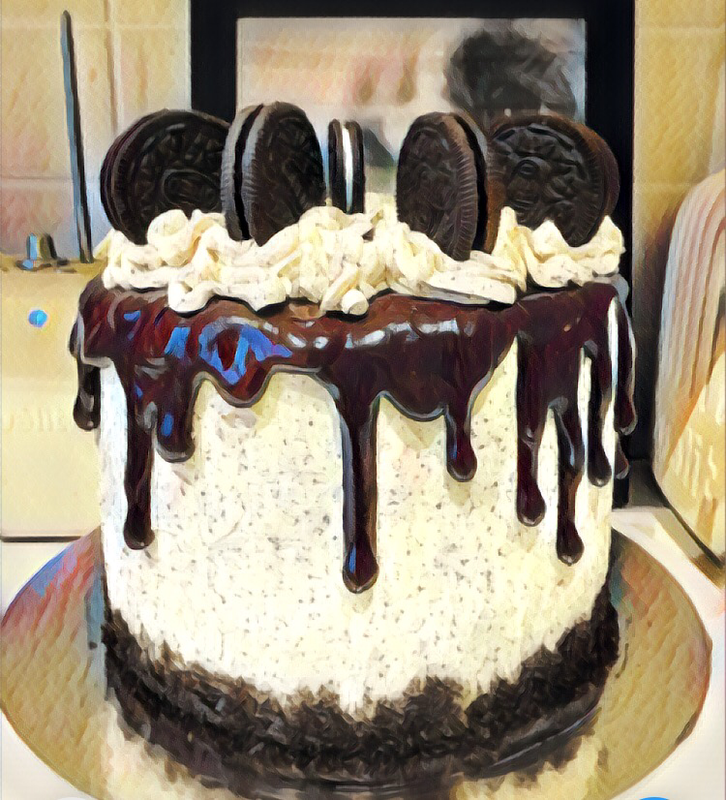 This is easiest if you pile the icing on top of the cake, then use a palette knife to ease it over the edge and down the sides. Use a cutlery knife to decorate the bottom of the cake with the reserved Oreo crumbs, brushing off any excess. Chill for another 30 minutes. Make the drizzle put the cream and chocolate into a microwaveable container. Heat for 30 seconds then remove and check, continue for 10 second bursts until melted. Stir only when the chocolate looks melted then mix well and transfer to a piping bag or a sandwich bag. Remove the cake from the fridge, snip the end of the piping or sandwich bag, you want a thin controllable stream so don’t cut off too much. Pipe ganache over the edges of the cake, so it drizzles down the side, start at the back of the cake to get the hang of it. 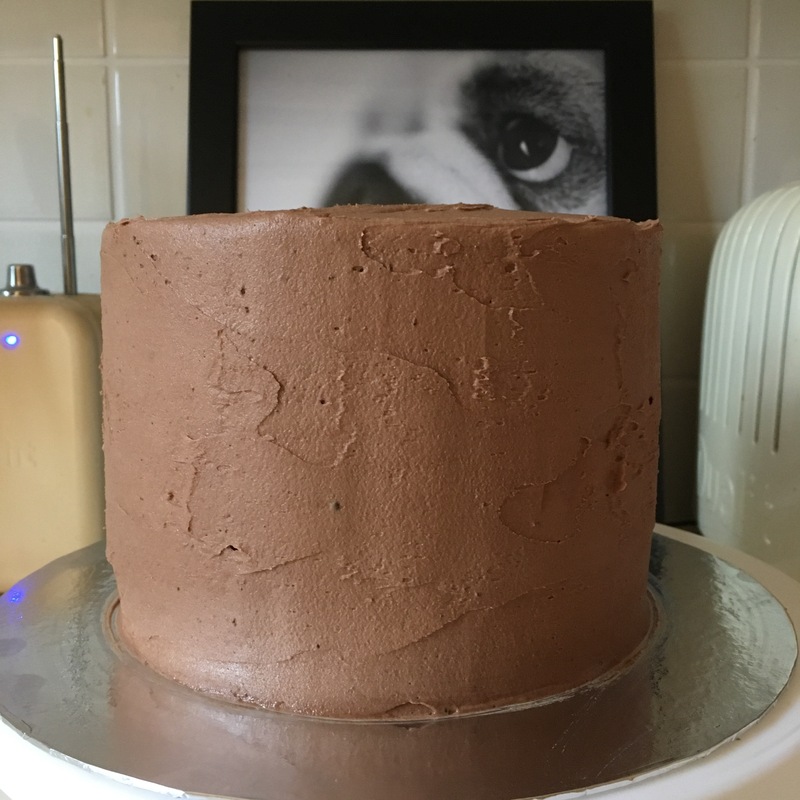 Fill in the middle of the top of the cake with chocolate too. Cool for 15 minutes. 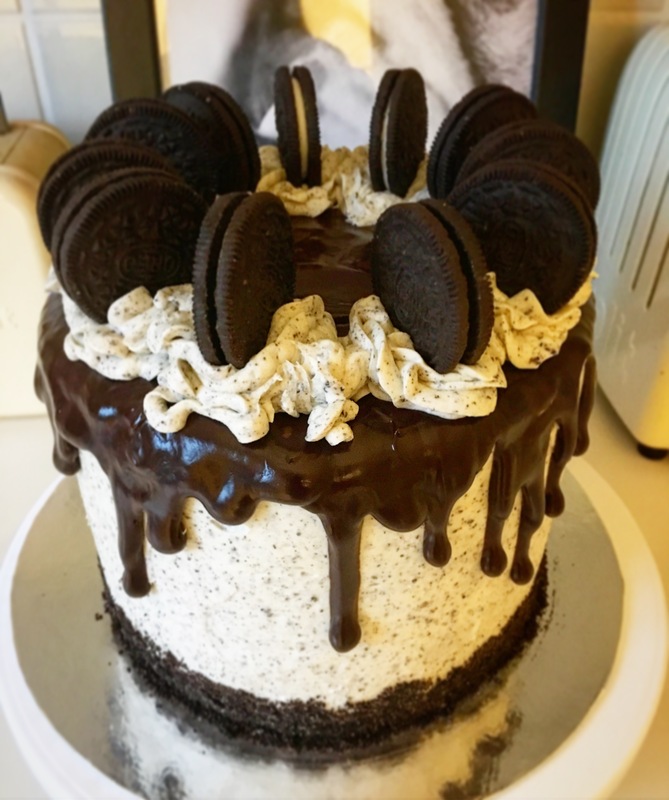 Pipe rosettes around the edge of the cake a place an Oreo on top of each one. Can be chilled now for 1-2 days but for best results bring up to room temperature for an hour before serving.